In the far away Raccroc Galaxy, two races of evolved humans, each living on their own mothership, are battling for control over the galaxy’s rich natural resources. You are the captain of one of these ships and it is your job to obliterate the other ship and therefore seize control of all the resources for your own people. No mercy! Conquest at Kismet is an asymmetrical two player card game. 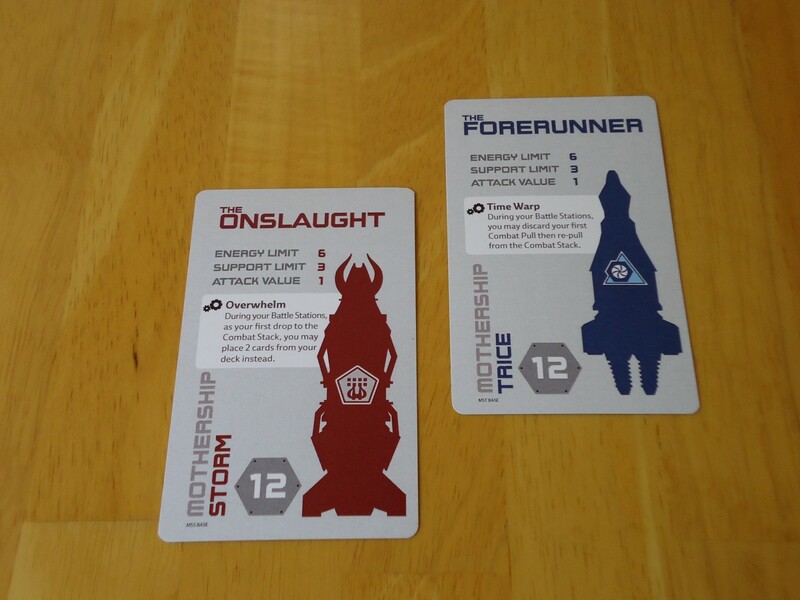 Each player controls one race, either Storm or Trice, and attempts to win the game by destroying the other player’s mothership. 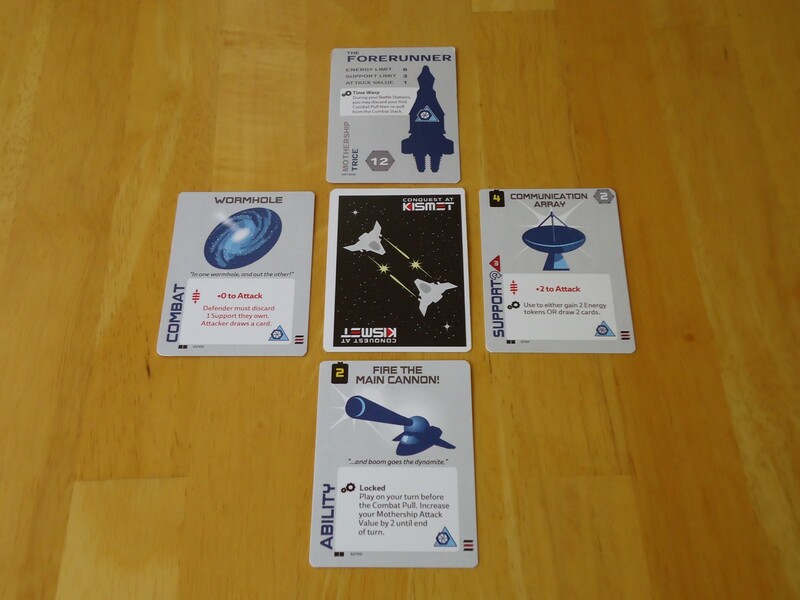 At the beginning of the game, each player is given the complete deck of blue or red cards and the corresponding mothership card. Players then alternate taking turns as the Attacker and Defender, playing cards and resolving combat, until one mothership is destroyed. There are lots of cards in this game and each one has different bonuses, abilities, and modifiers. Additionally, the deck for each race is different. Therefore, there are too many cards to list/explain every one in this review. As you play, you must keep an eye on the text of the cards as their effects come into play during different phases of the game and depending on how the card is used in the game. Recharge. Each mothership has an energy limit of six. Energy is expended as currency during the game to deploy support cards and pay for abilities. At the beginning of a turn you replace any spent energy, bringing your total for the current turn back up to six. Draw. Draw cards from the top of your deck to bring your hand back up to seven cards. If, during the previous turn, your hand exceeded seven cards, you must discard back down to seven. Time. This phase affects both players. After use, some cards require a “cool down” phase before their ability can be used again. Thematically, this is the same as a laser gun recharging or a hyperdrive cooling down, for example. These cards have arrow icons on them with a number inside the icon. The number indicates how many turns (or Clicks) the card must make before it can be used again. When the card is activated, the card is turned so that the arrow is pointed toward the opponent. During the time phase, any card in play that requires a cool down is rotated 90 degrees clockwise. It may not be used again until the card is once again facing you as though it has just been laid on the table. Some cards reactivate after just one turn, others require more. Since time is constant, both players turn any of their cool down cards during the time phase, not just the active player. If a card ends its cool down during the time phase, it is available for immediate use (regardless of whether the card belongs to the active player or the opponent). Deploy. During this phase, the Attacker may pay for and build supports for their mothership. Support cards are attachments to the mothership that provide extra abilities and weapons. Support cards are paid for in energy credits. You may deploy as many supports as you can afford, as long as you do not exceed the support limit of three permitted by the mothership. If three supports are already in play and you wish to play another, you must discard one to make room. You may not replace a support already in play unless/until you reach your limit of three. Battle Stations. This is where the combat happens. First, the Attacker must declare whether they are attacking their opponents’ mothership, one of the supports, or not attacking at all. Next, the Attacker may play a card from their hand face down into the combat stack (known as the Drop). The Defender may then drop a card from their hand into the combat stack or pass. Turns go back and forth until one player passes. Once a player passes, the other player may drop as many cards as he/she wants into the combat stack. When players have finished dropping cards, the Defender shuffles the combat stack and spreads the cards out face down in front of the Attacker. The Attacker draws one card, known as the Pull. If any abilities on that card require the Attacker to pull another card, the first card is discarded and none of its bonuses affect the final result of the combat. If the final card pulled belongs to the Attacker (and the Defender has no supports to negate the result), he wins the combat, his mothership’s attack value is added to any modifiers from the pull card and the total damage is applied to the opponent’s support or mothership, whichever was declared. The requisite number of damage tokens are placed on the damaged unit and destroyed supports are removed from play. If the final card pulled belongs to the Defender (and the Attacker has no supports to negate the result), the Attacker takes a Retribution token which represents a +1 that will be applied to that player’s next successful attack. Thematically, it represents a ship that escaped the failed battle and later exacts their revenge. 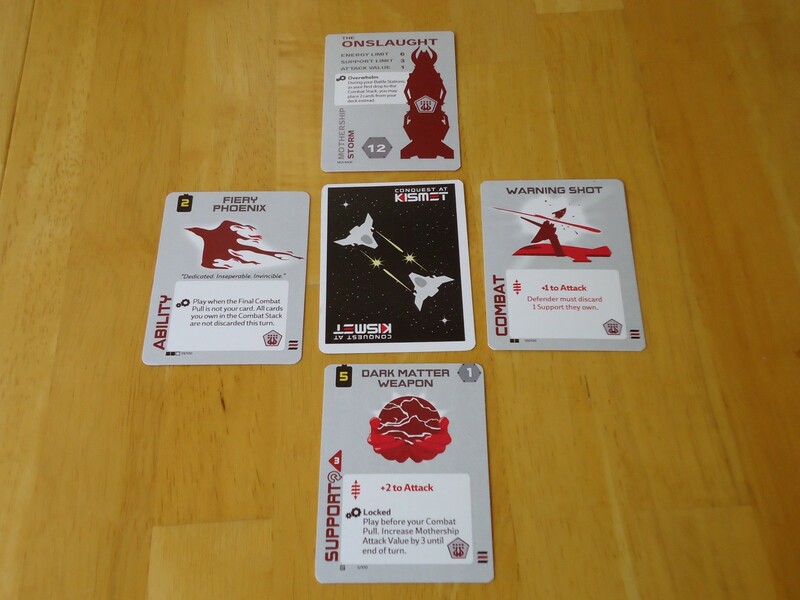 After combat is resolved and cards are returned to their owners, players switch roles, with the Attacker becoming the Defender, and play continues back and forth until one mothership’s damage value equals or exceeds its hull value, resulting in destruction. The remaining player is the winner. Trice the Fun or a Storm of Boredom? I’m always on the lookout for solid two-player games that are short enough to be played on weeknights, but deep enough to allow for meaningful decisions. Asymmetry is a plus, as it’s fun to get a different experience by playing the other side from time to time. Conquest at Kismet looked like a promising entry. Ultimately, though, it has a few problems that keep me from loving it. First of all, this game takes more plays than it should to get the hang of. This is one of those games that’s actually very simple to learn and play, but the poorly written rulebook does much to complicate that simplicity. Almost everything is there, but it’s not explained in the clearest way and leads to a lot of flipping pages back and forth to put all the pieces together. Fortunately, the designer included an extended example of play in the back which has pictures and makes much more sense than the explanation in the front of the book. Start there. It’s much easier to follow than the all-text explanation of turn order. Even with that, though, there are quite a few situations that will crop up during the game that will have you flipping pages and scratching your head while you try to work it out. Further complicating things, there is lots of card text you have to keep an eye on and the abilities, bonuses, etc. change depending on how the card is used in the game and during which phase it is played. You have to watch the cards on the table, as well as the cards in your hand so you’re sure to play things at the right time and take all the modifiers and bonuses to which you’re entitled. You also have to keep an eye on your mothership card because it also offers it’s own abilities. While this variety ultimately ends up being a good thing because it gives you more decisions to make during the game, the rules are skimpy on details about how the cards actually work/can be used during each phase and you’re left to figure it out as you go along. The good news is that the game does come together after a few plays and you will eventually be able to blow through a game in about twenty minutes. As for the gameplay itself, it wasn’t bad but I didn’t feel that it was great, either. The Combat Stack and Pull are advertised as “never been used in a card game before,” but it just didn’t feel that revolutionary to me. I’ve seen similar “deck stacking” mechanics used before in various games, although not exactly this way. It is an interesting tug of war. You can try to stack the deck in your favor by dropping more cards from your hand into the stack, but you do so at the expense of abilities and modifiers that you may need later. You need to put some thought into which cards to keep, which to drop, and when/whether to bow out and let your opponent continue stacking the deck. No matter how many cards you have in the combat stack, you can still get hosed. Sure, this kind of luck applies to both players because your opponent can get equally hosed on the next turn. It’s fair, but it still feels bruising to put in the effort to make a good strategic choice and then get blown apart, anyway. Since the result of the combat can literally decide the winner of the game, it’s really harsh to lose that way. At least the game is quick so you don’t feel like you wasted an hour only to lose on a bad draw. You can easily play another game to try to get in a win. I felt like the time mechanic was actually the more interesting mechanic. Having to put a card through a cool down phase added an interesting level of decision making. If I use it now, and it takes three turns to reactivate, what are the odds that I’ll wish I’d held off on using it? On the other hand, if I hold on to it, will I find a better situation in which to use it, or will I regret not activating it, even knowing that I’d have to wait a few turns to use it again? That’s far more interesting (and thematic) to me than a combat mechanism that comes down to the luck of a card draw. The asymmetry also felt lackluster compared to a game like Netrunner where each side has a very different goal and each side plays differently. Trice and Storm have different cards in their decks that play a tiny bit differently from those in the other deck, but the goal is the same: Destroy the mothership. The way to achieve it is also the same for both players: Play support cards and abilities and hope you win the combat. Both motherships are equal in terms of energy, damage they can take, and their base attack value. It doesn’t feel different to play either Trice or Storm. I like having a favorite role/side when I play an asymmetrical game and in this game I didn’t love one more than the other. As for the components, they are unnecessarily fiddly. 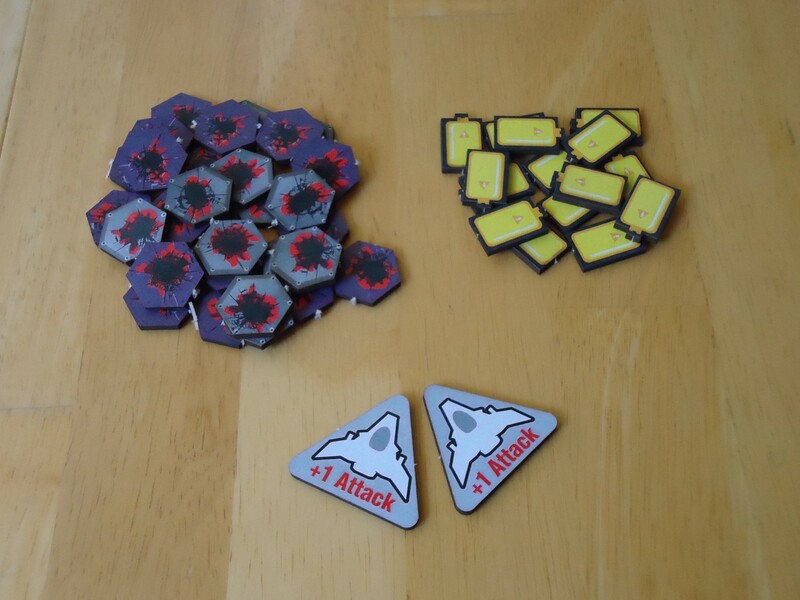 A pile of energy tokens and damage tokens are included to keep track of these stats. They’re functional, but since both motherships have an energy limit of six and a damage limit of twelve, you can give each player a D6 and D12 die and just rotate the numbers up and down. The mothership cards are perfectly suited to putting the D6 in the upper right hand corner and the D12 on the damage icon on the card. This is so much simpler than counting out tokens and making sure you’ve got exactly the right number (not to mention chasing tokens all over the table). It’s also much easier to keep up with a couple of dice compared to piles of tokens if you want to take the game on the road, and since the portability is one of the better points of this game, it’s a shame to compromise that with unnecessary tokens. I will also say that the art is also fairly bland. It gets the job done, but the illustrations are not detailed and there’s no atmosphere. For space-themed games, I’m much more a fan of colorful, evocative art such as that found in games like Star Realms, Core Worlds, Eminent Domain, Among the Stars, or Race for the Galaxy. Conquest at Kismet has none of that eye candy. Yes, the cards are easy to read, but I think I could have gotten more into this game if it offered some evocative art instead of single color, two-dimensional illustrations. The mechanics of the game do a decent job of supporting the theme of a space battle, but the art fails to capitalize on that. This won’t bother those of you that don’t care about eye candy, but it bothered me. Just be aware that if you’re looking for a thematic space game, this one is only halfway there. I just don’t feel that the value is there for Conquest at Kismet. Its retail price is $29.99, which is very close to or more than some of the games I mentioned above. Yet those games offer a much more immersive experience and deeper gameplay. Yes, Kismet takes less time to play than some of those other games and that would be a reason to choose it over some of the others. But, again, for the value, such a quick playing, stripped down game feels like it should be a $15 game, not a $30 one. Ultimately this game falls into the good but not great category for me. It has a couple of interesting mechanics, offers some decent decisions, and the short playtime and easy set up are ideal for a weeknight game night. But the bland artwork, the lackluster combat mechanism, and the lack of strong asymmetry really drag this one down for me. There are just so many other games that do the same thing as well as or better than this one. It isn’t a bad game, just uninspiring. I’m sure there there are people out there who will likely love it more than me. However, for us, it just fell a little flat. 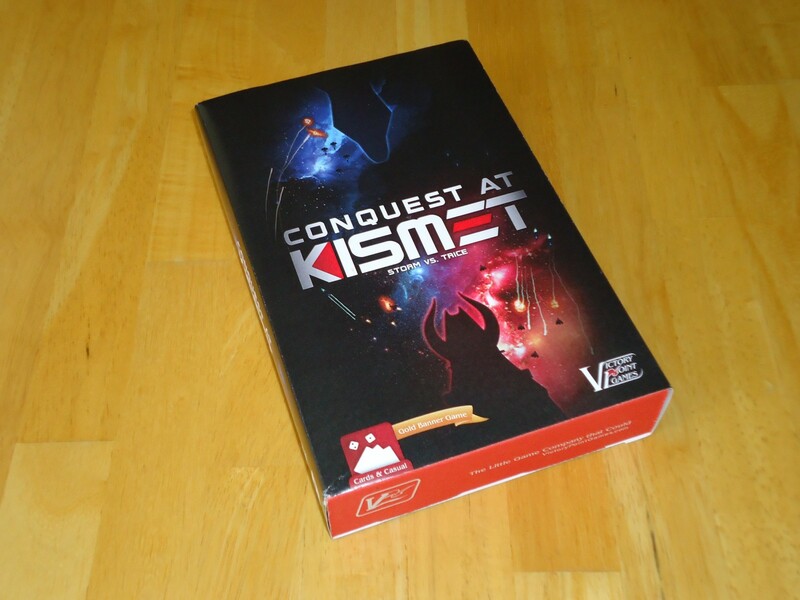 iSlaytheDragon.com would like to thank Victory Point Games for providing us with a copy of Conquest at Kismet for Review. Easy set up, fast play. The time mechanic is thematic and interesting. Art is bland and not very immersive or thematic. Combat resolution comes down to the luck of the draw. Excess fiddliness in the components. Value for money isn't as strong as in similar games.